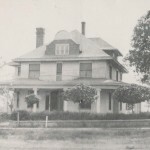 This 1898 home-turned-house-museum built in former “Indian Territory” is said to be haunted by the ghost of former resident Mrs. Foreman, who passed away in the home in 1968. Its caretaker said he often looked up while working outside to see the apparition of Mrs. Foreman in the doorway watching him. Cold spots and uneasy feelings have been reported here as well.